American butterflyer John Batchelder had a year to remember in 2017. He was nominated for the 2017 World Open Water Swimming Man of the Year for his prolific year of butterflying across the United States. 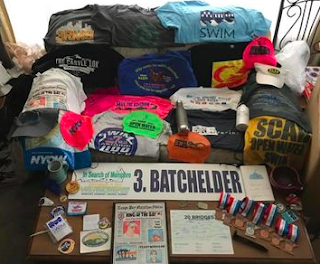 John Batchelder set the bar so high, it is almost inconceivable that any man will have the patience, passion and planning to replicate the totality of his butterfly open water achievements within one calendar year. The 36-year-old took on 19 open water races and channel swims - all butterfly - in addition to doing 3 marathon swims freestyle this year. 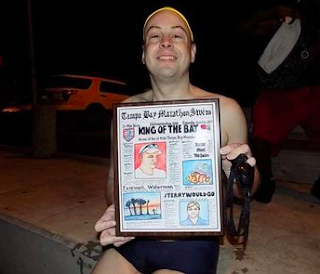 His butterfly swims include a 38.6 km swim in Tampa, a 45.8 km swim in New York, a 30 km swim in Pittsburgh, a 19.3 km swim in Charleston, a 57.9 km swim in North Dakota, a 15.2 km swim in Arizona, a 17.7 km swim in Portland, and a Catalina Channel attempt. He knocks off these brutally tough all-butterfly swims with a calm demeanor and steely determination. He does all this swimming while balancing a busy corporate life and constant travel from coast to coast in the United States. For his indomitable spirit in the face of rough conditions, for his personal ambition to redefine toughness, for his understated joy while tackling channels, seas, rivers and lakes over 347 km in distance, John Batchelder is a worthy nominee for the 2015 World Open Water Swimming Man of the Year. * 19 open water events and channel swims planned to do all butterfly. The total distance swum butterfly in open water swimming competitions in 2017 was 309.9 km while the total distance swum freestyle was 37.3 km. The total distance was 347.2 km with two DNF's (14 km out of 17 km in Apache Lake at the S.C.A.R. Swim Challenge + 12.9 km in the Catalina Channel attempt). To vote for the WOWSA Awards, including the 2017 World Open Water Swimming Man of the Year, visit here.